I haven’t been cooking much the last few days as we have been closing up the Utah house and taking the long ride home. We stopped in Bakersfield and ate at Macaroni Grill where I had a salad and penne with vegetables in a pomodoro sauce. I think there was enough in the bowl of penne to feed two hungry people so I ate all the vegetables and a little of the pasta. All in all it was a pretty successful eating out foray. Now that we are home I feel like I need to throw John a veritable bone and let him have some red meat. He grilled up some lamb chops, I pulverized the rutabagas in my trusty pressure cooker and made a concoction of green beans, garlic, cherry tomatoes, and a super hot chile with a touch of butter. What could make John happier than some grilled meat and a spicy vegetable?! 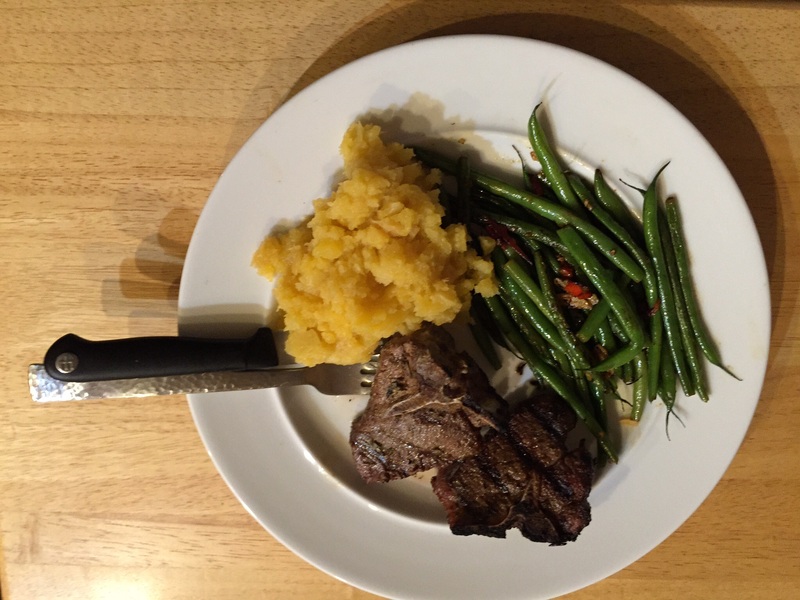 This entry was posted in Uncategorized and tagged green beans, lamb chops, rutabagas. Bookmark the permalink.